1. Mix eggs and sugar in a bowl and warm on hot water. Mix until body temperature. When warmed, whip until stiff. 2. Add and mix flour and powder tea into 1. Mix in olive oil and milk. 3. Pour batter into a pan with baking sheet. Bake at 350 degree F for 8 minutes. 4. While cooling , mix heavy whipping cream, granulated sugar and tea powder. 5. Spread 4 on 3. 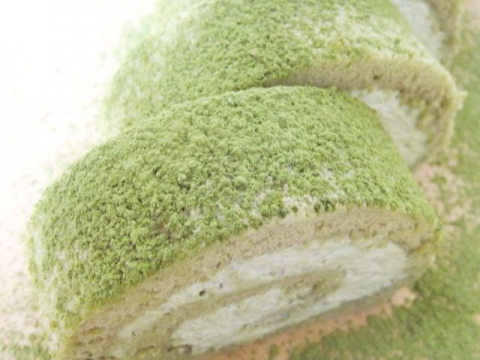 Roll cake.